Until very recent times, serious studies of Ozark history and culture have been few and far between. Most of us have been content to let travel writers and folklorists portray the region as a place where life was simpler, the landscape remained unspoiled, and time stood still. While some of that description was true, much of it was not. Now, finally, we can drink from a deep, clear, wellspring of Ozark reality instead of the snake oil that produced bucolic visions of the “good old days.” To force the scales from our nostalgic eyes, the University of Arkansas Press has launched its “Ozarks Studies Series” to publish new scholarship about the old Ozarks. Brooks Blevins, Noel Boyd Professor of Ozarks Studies at Missouri State University, serves as the series editor, guaranteeing the works included will examine the region with objectivity and clarity. 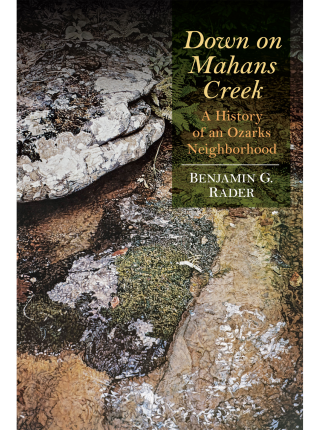 The inaugural offering of the series is Down on Mahans Creek: A History of an Ozarks Neighborhood, by Benjamin G. Rader. Born and raised in the Shannon County, Missouri, area of Mahans Creek, Rader grew up to become a professional historian. After retiring as the James L. Sellers Professor of History at the University of Nebraska, he decided to use some of his newfound spare time to document the history of home. As Rader writes in the preface, “I try to reconstruct the fundamental customs, beliefs, and behaviors that governed the lives of the families residing on the Mahans Creek watershed or the Missouri Ozarks from its settlement in the nineteenth century to the mid-twentieth century” (p. x). Benjamin Rader’s ”try” has produced an exhaustively researched, eye-opening revelation of real people in the real Ozarks. In the book’s opening paragraph, Rader pens a description of his Ozark grandfather, Sam Rader, that’s enough to raise the hopes of anyone who cracks this book hoping to find hillbillies. Sam Rader is introduced to us as a self-proclaimed backwoodsman who loved a pretty dark-haired girl, yellow sucker-fish, deep swimming holes, cornbread in a cast-iron skillet, and hound dogs. It’s a hillbilly calling card, and all in the first paragraph! But by paragraph’s end, we learn a revealing fact about Sam Rader: he named his most beloved hound Caruso. Sam Rader was quite familiar with opera singer Enrico Caruso, because the Rader family listened to the opera singer’s pure tenor voice on their Victrola. The reader may be taken aback. Ozark rural folks- hillbillies, go ahead and say it out loud- listened to opera? There’s more to the Ozarks than moonshine-swilling barefoot hayseeds and corncob-pipe-smoking grannies? Benjamin Rader just pulled the rug out from under the Ozark stereotype. And he will continue to do so on every page of Down on Mahan’s Creek. Rader takes a rich body of family history, genealogy, and oral tradition from kith and kin and illuminates that information with facts gleaned from census enumerations, tax lists, Civil War records, and newspaper articles. Along with a thorough study of community dynamics, Down on Mahans Creek explores agriculture, education, social life, local industry, and out-migration. There’s even a brief chapter on African Americans and race relations in Shannon County, a much-needed reminder that the Ozarks have always been much more than an “Anglo-Saxon seedbed,” a claim trumpeted by writers from the 1800s well into the 1950s. Be patient with Rader’s detailed forays in family kinship ties. You’ll be rewarded with great insight into the dynamics of a rural Upland South community. Be mindful of your reaction when Rader challenges-or reinforces – your perception of the Ozarks. Are you disappointed? Relieved? Figuring out why you feel that way will offer some valuable insight into how you decide what to take for the truth. If you’re looking for the real Ozarks, you’ll find it down on Mahans Creek.